As a Web designer, I spend a LOT of time on the Web. As a curious person, I spend a LOT of time using search engines. But as a person who values my privacy, it pains me to know how my daily activities might be used against me. I know Google’s motto is “Don’t Be Evil,” but they’re watching you and me and tracking our every move on the Internet. If you use Google as your search engine you will get great search results. But at the price of your privacy. Maybe that doesn’t mean much to you. But it does to me. Every time you do a search, Google “captures” the information and adds it to an ongoing profile of your searching habits. This is a gold mine of information that they sell to marketers who then “feed” you ads that are geared to your interests (as displayed in the content of your searches). If you search for toasters, all of a sudden you will be finding ads for toasters when you visit Web sites. That’s how they do that. By tracking you. I don’t want ads. And I don’t want the feeling that my curiosity is an open book. I would rather explore the universe of knowledge (and shopping) in privacy. Until recently, I have been using an alternative search engine called Scroogle Scraper. Scroogle acts like a cloak or mask to hide your IP information from Google while it uses Google’s search database for results. I’ve been happy with Scroogle until quite recently when I’ve found it unavailable for some unexplained reason(s). So I went searching for an alternative. And I found one. I, too, appreciate the relevance of results that a Google search produces. But I don’t want them to know my every thought and track my curiosity and sell my information to enhance their bottom line. Thanks, but no thanks. What if I told you that you could get the same excellent search results, but without the prying eyes? Would you be interested? 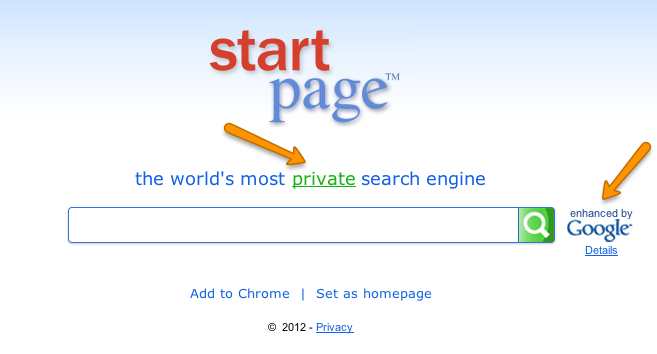 It’s called StartPage, and it uses Google’s search engine, but promises no tracking. StartPage also “masks” your IP information, so no traces of you are retained by Google. But it goes one step further. It also act as a Proxy when you surf the Web using your search results as the springboard. More on this service in a future post. Thanks for the feedback! Agreed that Google esleping with the government does open too many avenues for privacy invasion. Add medical records on top of that ouch. @MiriamEllis Nice to hear from you, and you’re right that the interchange between govt and corporations has crossed a threshold of no return. My concern is that Google has been keeping a record of every search we do with the goal of improved personalized search. I can’t imagine the government would use that information for our personal best interests, no matter who was in the White House. ****Been thinking about alternatives and what an individual can do? It is possible to opt out by turning off search history recording in the settings page of one’s Gmail account. Each person can also edit their history, including removing it entirely. Latest events with Schmidt’s appointment should make everyone aware of their actions and options to opt out.Bottom line, I’m hoping there will be a separation of Search State. Thank you for mentioning the clear history approach. Sadly, I tried to do that following several sets of instructions I received. On none of the pages I visited (on Google) did I find any buttons to push to remove my history. I kept being sent round and round, bounced between pages and asked to login multiple times. I’m not sure what was going on, but I wasn’t able to do what I wanted to do. So mostly, I am doing my best not to give Google any information about me and I use AdBlock so I’m not getting the obnoxious (and creepy) ads that pop up in response to their data mining.